Over 100 miniature Gothic marvels carved in boxwood have been identified, located in the world’s foremost museums and collections. They are all fashioned using the same technique and are probably from the same workshop. It appears that the master craftsman who created this work group redefined the technical limits of the woodcarver’s art around 1500. The elegance and fascination of these miniature artworks, which may justifiably be called microscosmic marvels, lie in the consummate skill of the carving combined with the complex representation of scenes from the Old and New Testaments. Embedded in radically miniaturised architectural structures whose forms echo those of Gothic cathedrals, these microcosms were intended for private devotion. But they were also highly valued as collectors’ items by the social elite of the age. 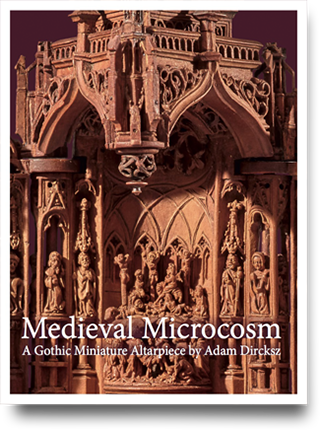 This book describes a newly discovered miniature Gothic boxwood altarpiece, created some 500 years ago. Classifying this extraordinary work of art and placing it in its historical context involved intensive research, the fruits of which are presented here.